This lovely sterling silver and enamel pendant features the Indalo man, recognised in southern Spain as a symbol of protection and good fortune. Even today, small village pueblos lie hidden behind the giant sierras that roll down to the Mediterranean shores and the Indalo is known for its good luck qualities. People who are lucky think positively, look for opportunities and are always open to possibilities. 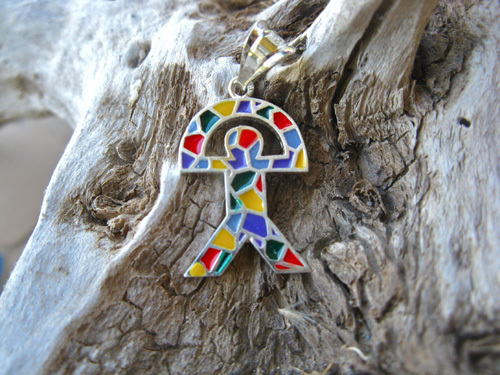 Description: The Indalo enamel pendant is 28mm long including the hanging bail. Please note that no chain is included (although we can supply chains separately). Do you know someone who could do with some extra luck for an important event, or just needs to feel a bit more positive at the moment? Show them you care with this colourful silver pendant. Comes gift-wrapped, like all our presents (with an information card about the Indalo) - and we can print a personal message on your behalf.